It’s almost a month now I had posted any recipes. I had mentioned in the past that summer is very hard to blog and schedule is tightly packed with family activities and work. Summer always intrigues me to blog with good pictures, but time constraint deters my plans. This year my gardening effort went down the drain. My exertion to have an organic garden was devastated by the uncontrollable deer problem that we are facing now. Even though I have a fence around my garden, deer jumped in and ate all my plants. The pathetic look of my garden dissuades me to spend more time in the garden this summer. They get smarter and smarter each year when I try tricks to evade them from my garden. Yesterday when I went for a walk in our neighborhood, I noticed that it was not just my garden, it seemed like the whole neighborhood is getting invaded by the deer. I saw different kinds of deer repellent products in the yards of many houses. Nothing seems to be working due to the excess population of deer. I remember when we used to live in a different city where I wished to see a deer crossing. I think my wish is granted to live and share food with them now :). I don't feel like giving up though. Hmm...A tall fence is the only resolution I can find for the persistent deer issue. Last weekend I made this cheesecake for a get together and it turned out to be a delicious dessert. I was pleased with the outcome of my trial. The most exciting fact was that cheesecake came out without any cracks. The best part about this recipe was it was so easy to prepare. All it takes is some mixing and baking to the right consistency. 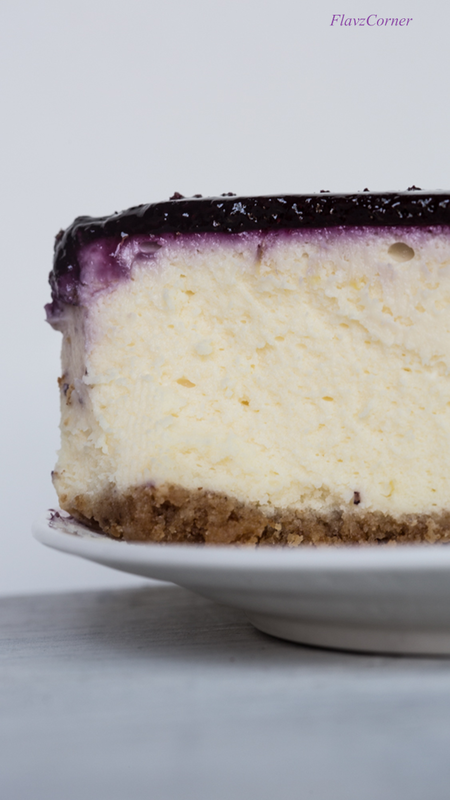 The combination of the cheesecake with berry topping takes the plain cheese cake to the next level. So don't skip the topping if you are planning to make this. Go ahead and make this cheesecake for a party and wow your friends and family. Please make sure to read the notes and the recipe before you start. Take a 9 inch spring form pan and grease it using butter or cooking spray. In a separate bowl, combine graham crackers crumbs and melted butter, so that the crumbs are all coated with melted butter and wet. Press the wet crumbs with your hands on to the bottom and to the sides of the spring form pan leaving one inch space from the top of the pan. Cover it with a plastic wrap and refrigerate till you are ready with the filling. Prepare the filling in the meantime by mixing the cream cheese in the bowl of a stand mixer or regular hand mixer. Mix it till it becomes were smooth. Add 1 cup of sugar and 3 tbsp. of all purpose flour to the cream cheese and mix well for 30 seconds on low speed. Now add 1/3 cup of heavy cream and mix till combined. Scrape the sides in between for uniform mixing. Add one egg at a time and mix well on low speed. The mix will be little loose at this point. Add the lemon zest and vanilla extract and mix for 20 seconds. Take the spring form pan out of the refrigerator and pour the cream cheese mix into the spring form pan that has the graham cracker base. Tap the pan few times to remove any air bubbles. Set the timer for 15 minutes and place the pan in the middle rack. Cook for 15 minutes. Now lower the temperature to 250°F and set the timer for 1 hr 15 minutes and cook till its done. Take the pan out of the oven, it may look little bulged at the top and the center will be wobbly. Turn off the oven and return the cheesecake back into the middle rack and let it sit inside the oven and cool for 30 minutes. After 30 minutes take the pan out and let the cheesecake cool completely inside the pan. Meantime you can prepare the topping. Take a small bowl, sprinkle 1 tsp. of gelatin over 1 tbsp. of cold water and keep it aside to bloom. 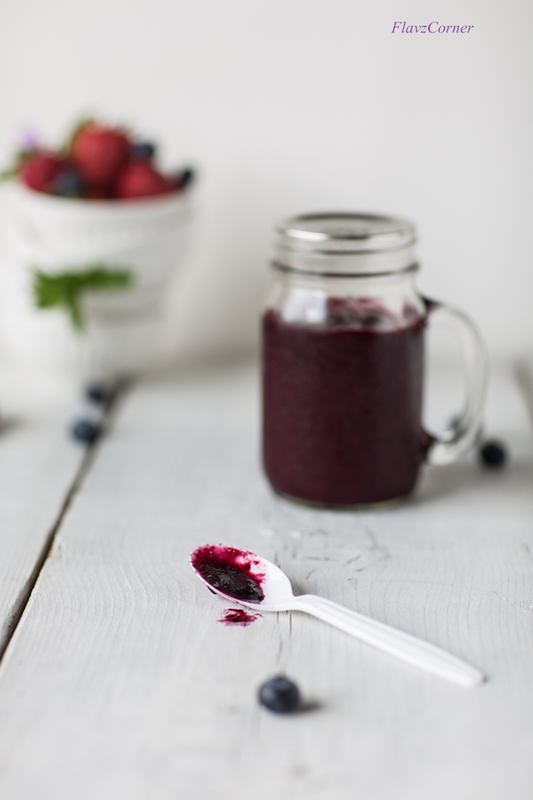 Puree 1 1/4 cup berries in a blender. Pour it into a sauce pan and add sugar and lemon juice. Cook on low to medium heat for 20 minutes stirring occasionally. Turn off the flame and add the bloomed gelatin into the hot sauce and mix well till the gelatin is dissolved completely. Let the sauce cool completely. Once the sauce is cooled, pour it over the cheesecake and spread on the top by leaving the edges. Cover the spring form pan with a plastic wrap and refrigerate over night. The chilled cheesecake can be easily released from the spring form pan and transferred to a cake stand. 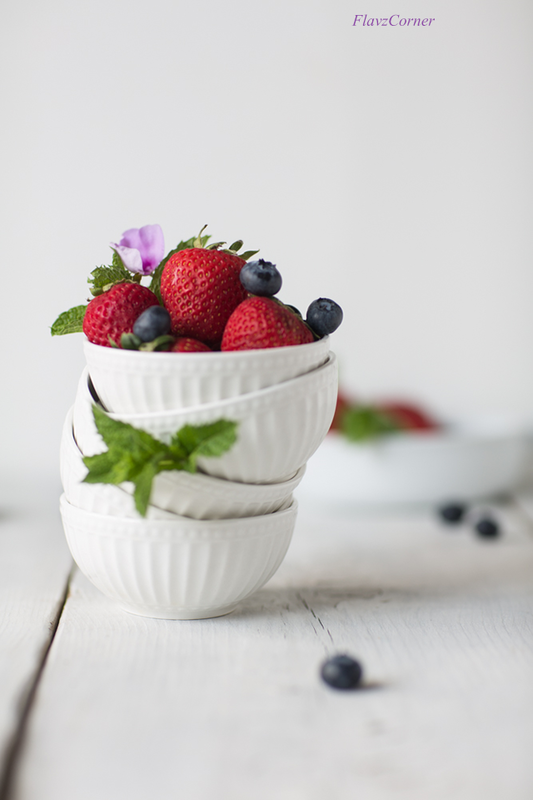 Slice it as desired and top them with a piece of strawberry and blueberry before serving. You can use a food processor/blender to make the graham cracker crumbs. Alternatively you can use the base of a cup to crush the graham crackers. Make sure that you leave the cream cheese and eggs outside the refrigerator to get to the room temperature which helps to achieve a smooth batter and results in a smooth textured cheesecake. You can prepare the base just by pressing them to the bottom and avoiding the sides. Make sure not to over beat the batter which will end up in big air bubbles that can ruin the texture and cause cracks in the cheesecake. Use low speed settings of the hand mixer or stand mixer. Cool the cheesecake for 30 minutes in the oven, which will help to set the cheesecake to the right consistency. Cheesecake can be prepared in other metal pans or in glass bake wares. But please note that the cooking time will vary depending on the bake ware you use. Aluminum pans take less time, while dark metal pans and glass bake wares takes longer time. I baked mine in dark 9 inch spring form pan. 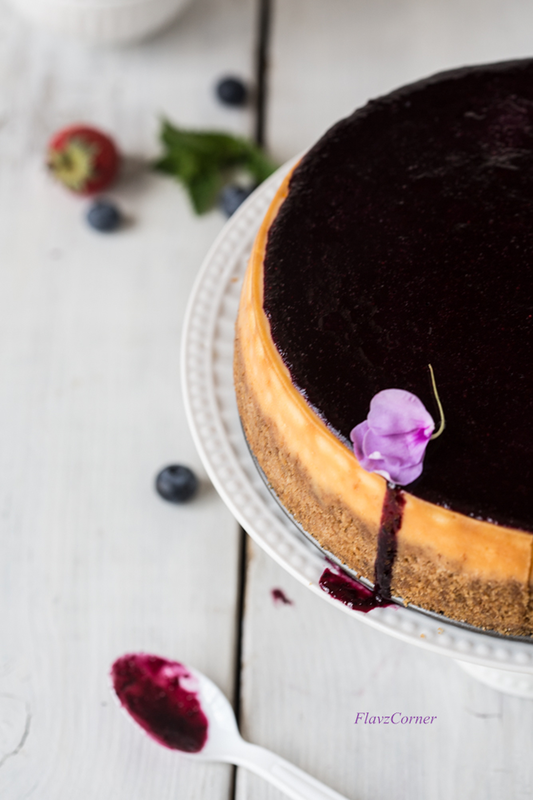 If your cheesecake happens to crack, don't fret, you can hide it by the fruit topping which not only gives an appealing look, but also adds more flavor to a plain cheesecake. Loovve the look of the berry topping cheese cake slice. Sad to know about the deer menace. Its difficult to see all the effort go in vain. Sorry to hear about your destroyed garden :-(( Your cheesecake looks fabulous! Oh wow! What an alluring looking cheese cake, Shibi! And that berry topping is killer! Lovely share! The cheesecake looks super delicious with the berry topping..but here am the only one who loves cheesecakes so hardly make these days..deers are smart,didn't know they even climb the fence..gardening looks tough there,good luck !! We have a raised bed garden, and I made cages out of PVC pipe that fit all around the garden -- and covered the cages (including the top) with heavy mesh netting. Might work for your deer, although it's a bit of work. Didn't keep the squirrels away from our tomatoes, though -- until I put a layer of chicken wire over the netting (they chewed right through the plastic netting). Anyway, lovely dish -- thanks. Miss you Shibi! 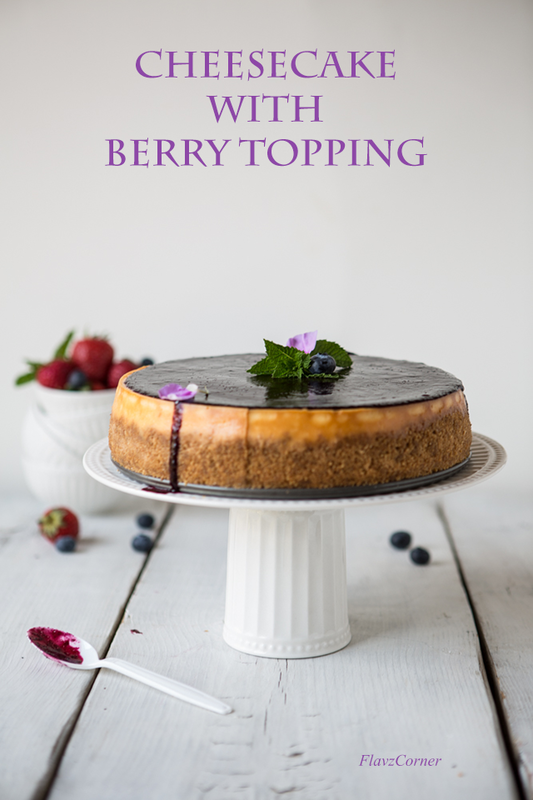 Cannot wait for you to post again - this cheesecake looks so so good - love the topping! That looks so yum Shibi!